Hey, everyone! I had an awesome time doing this week's STS post because I was able to do it with my best bloggy friend, Nicole! The video of us making fools of ourselves is so long (only 16 minutes!) that it couldn't upload to youtube and blogger can't support it as a file from my desktop, so unfortunately I just have pictures since I don't have enough time to get it to youtube. :( Bummer, right? 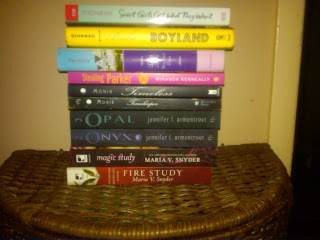 This week I was able to get my last few Hanukkah books, so it was pretty awesome and full of contemporaries. I hope everyone has an amazing Christmas! I love Maria V. Snyder, I hope you like them. Happy reading. OOoh very nice!!! I absolutely ADORE Maria V. Snyder!! Loving Jen's Lux books too! Still need to read book 2 and get book 3 which I had planned on reading back to back! A nice haul! The Lux series is one of my favourites & I adored Lola. Have a wonderful holiday break & happy reading! Holidays are awesome. Great haul of books. Looks like you got some awesome books. I love the Lux series, hope you do too. Happy Hanukkah. Great parents you've got there? Have you read Obsidian and Onyx yet? It's a great series. ;) And Lola and the Boy Next Door. They either had great taste, or they certainly knew what you wanted, huh? Great haul! WOW! 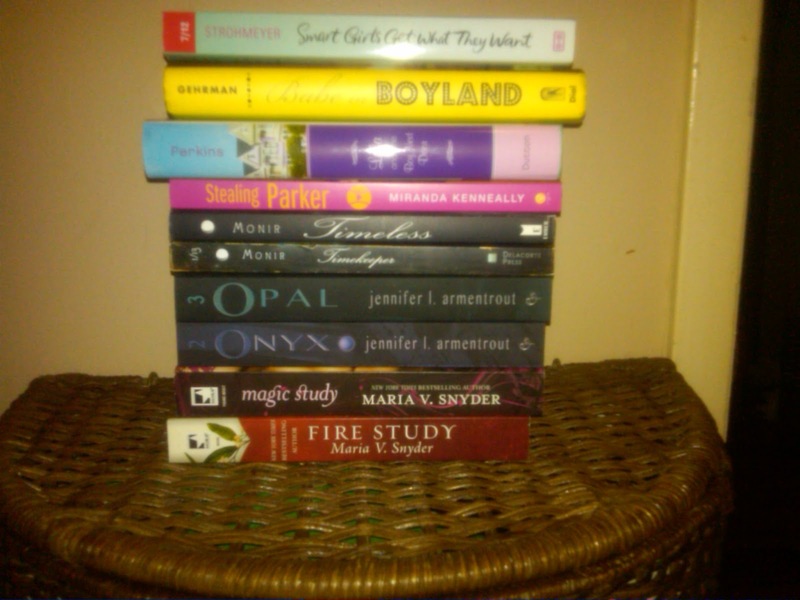 Look at those awesome books :D I also got Opal this week and I am GUSHING about it already - I missed Daemon, lol! I hope you enjoy Onyx and Opal as much as I did :) I think I may add Magic Study & Fire Study to my to-read pile they sound wonderful :) Happy Holidays! Awesome haul!!! I love the Lux series and I finally got the thirs book Opal. Can't wait to read it :). What do you think of the Lux series??? ooohhh another fan of Maria V. Snyder, I love her Study series. I love Lola and the Boy Next Door, Onyx, Opal, Destroy Me and Stealing Parker! I also want to read Babe in Boyland. It looks really funny! Heard great things about Maria V. Snyder's series. Happy Reading and Happy Holidays! Ah! I haven't read the Obsidian series yet but I can't wait! Great haul! Aw, what a shame! What if you cut the video in half (you could try Windows Movie Maker) and uploaded it as two 8 minute vlogs? Anyway, what a great stack of books! I enjoyed Smart Girls... and I am still yet to read Lola! So nice of your parents to buy you Poison Study sequels! Babe in Boyland is a great read! It's one of my favorites! Awesome books! Oh, why did I not buy the Lux Series in hardcover? I read them on my Kinde, but looking at those beautiful spines...drool. Great line up. Enjoy! Great presents! I really need to try a Jennifer Armentrout book I think! Everyone seems to really like them. Happy reading. Ooh! Lovely haul! I really want to read some of Jennifer Armentrout's books! I've also heard that Babe in Boyland is quite good. I have Lola and the Boy Next Door, as well as Stealing Parker on my kindle that I am looking forward to reading sometime soon! Awesome book haul!! I'm still waiting on my physical copy of Opal to come in. (Thankfully I also bought it for nook so I read it already)I was gifted Stealing Parker two weeks ago!! It sounds awesome! I want to read Smart Girls Get What The Want and Babes in Boyland!! Hope you enjoy!! Happy Holidays!! I love Maria V. Snyder and her Study series is the best! My Book Haul! Letterbox Love! Lola! I loved that book. I've been wanting to read the Poison Study series too. 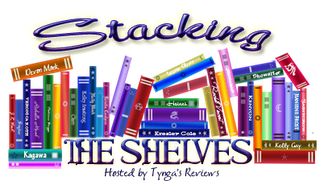 Yay my first Stacking the Shelves. I hope you will all pop over and check it out! Awesome book haul! I have read one Jennifer Artmentout book and would love to read more! Yay, I'm glad Smart Girls Get What They Want made it safely to you! And I hope you love it, I was surprised how much I enjoyed it (wait, did I write that on the note to you, too? Doesn't hurt to say it again I suppose haha). One of my best friends - who is NOT a reader by any means - can't stop raving about the Poison Study series and I'm mega-curious about it.